One side of the Pyramid of the Feathered Serpent at Xochicalco. Most archaeology buffs visiting Mexico City head straight to Teotihuacan to the north of the City. But there’s another site that’s also important in the prehistory of Mexico that’s just a couple of hours south of the city. Perched on a hilltop remote from any major cities, the ancient city of Xochicalco still commands our respect and appreciation. It is, indeed, beautifully situated. And its remoteness keeps it from being overrun by tourists. Xochicalco was occupied from about the third century until it peaked around the ninth century and was then destroyed about the 10th century. The city flourished as the Mayan city-states and Teotihuacan declined. 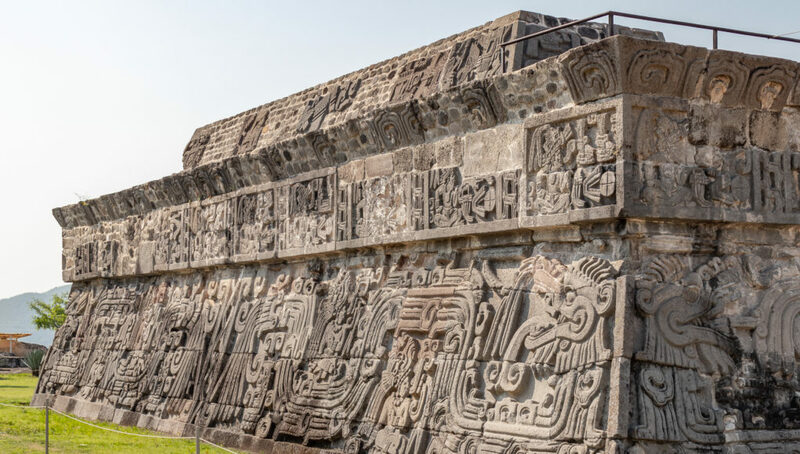 In its proclamation adding Xochicalco to its list of World Heritage Sites, UNESCO described Xochicalco as “the supreme example” of the type of fortified, strategically placed cities that were habited during what’s known as the Epiclassic period. Even though the area of ruins seems large to me, only about 15% of the old city has been excavated. 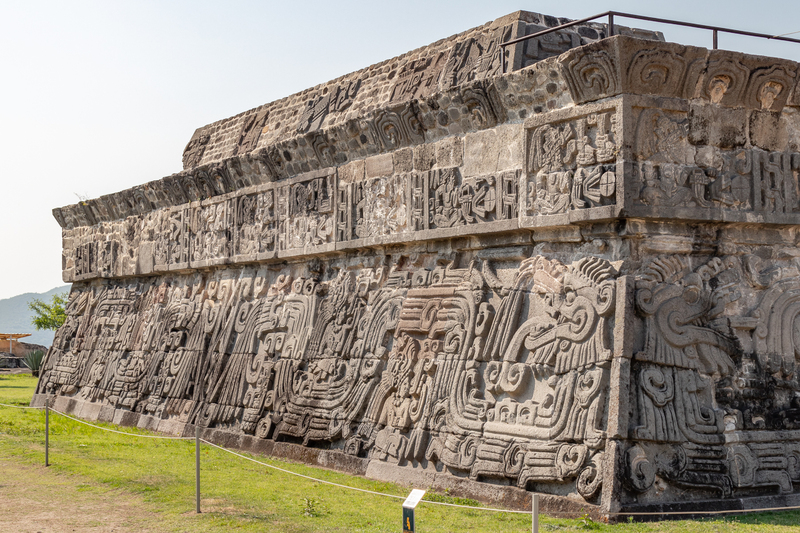 My favorite feature is the Pyramid of the Feathered Serpent (Piramide de la Serpiente Emplumada), that has really cool artwork covering its entire surface. A good look at the Xochicalco cornice style. Eight feathered serpents cover the four sides of the pyramid, along with seated figures and a single repeated date. The pyramid was restored to its current condition in 1909 by Leopoldo Batres. The pyramid has the unique Xochicalco cornice style that’s different from the architectural symbology of other important cities like Teotihuacan and Tikal. The ancient city of Xochicalco sits in a commanding position on a hill above the surrounding area. A model of the ancient city in the museum of the Xochicalco archaeological zone. An ancient sculpture called El Señor de Rojo (The Red Man) in the site museum of Xochicalco. One of the eight feathered serpents adorning the Pyramid of the Feathered Serpent at Xochicalco. The main Ball Court at Xochicalco. The main plaza at Xochicalco. The stairs up to the Plaza Principal at Xochicalco. A view of the Templo Serpiente Emplumada from the Acropolis at Xochicalco. Archaeologists believe that the upper structure matched the shape of the lower structure but has lost its upper layers of stone. The stela in the center of the Plaza de la Estela de los Dos Glifos at Xochicalco. Next articleTaxco, the silver city on a hill.